** You can see an updated spring cleaning post + checklist here! Lately while trying to organize the website into more specific sections within each category I noticed that it has been a long time since I’ve done a home tip. We started spring cleaning last weekend and are continuing to do so this weekend so I thought it might be helpful to share some of what we do with all of you. I sat down during the week and compiled a checklist, as seen above, that I think will really help with all of your spring cleaning! Just click on the photo above to bring it to full size and open it in a new window. From there you can print right from your browser in whatever size and color-scale you prefer. We got a lot from this list done already, most of the rest will get done this weekend and some things (like the outdoor items) can’t be done until it warms up some more but we’re well on our way. I know most people dread spring cleaning but I absolutely love it… something about the idea of a fresh start as the weather starts to turn makes me feel really satisfied. 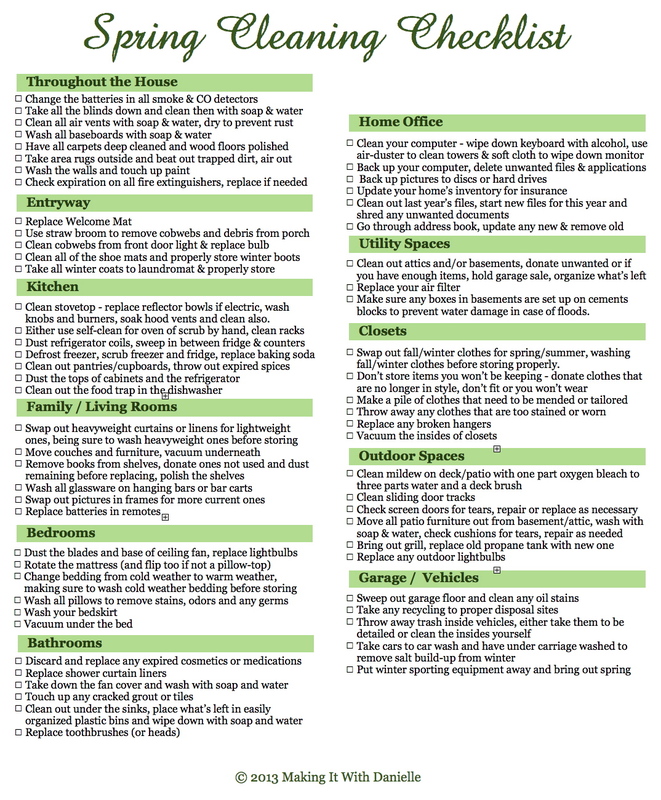 This list is just what we do, you may have to add to it or remove some things depending on your home or how much you want to take on but it should be a great starting point! If you’re busy like me, another useful thing to sign up for is a maintenance reminder that saves you the step of having to remember to do certain tasks throughout the rest of the year. AllState has a free one that gives you preventative tips, customizes alerts and then schedules reminders for you that can be texted or emailed so if you’re one of those people that just plain doesn’t remember to do these things, that might be a useful option! Let’s start going down the list! Some people like to change their detector batteries only when they are low enough that the detector alerts them to it, but just to be safe we change ours every spring. We have aluminum blinds on all the windows in the house so we take them down, bring them outside on an old sheet on the sloped part of our yard and scrub with plain old soap & water. We rinse them off with a hose and dry them with a towel so they won’t rust. We have metal covers on all of our vents, so we pop them off and clean them in the sink with warm water and soap being sure to dry them well before putting them back on to prevent rust. If they’re really rusted, we simply replace them with new ones. My mom was always a stickler for clean baseboards when I was growing up so we do a pretty good job year-round of wiping ours down but every spring I take a sponge and a bucket with soap and water and give them a good scrubbing. If you can, having your carpets shampooed once a year is a great way to not only get rid of heavy stains and odors but extend the life of your carpet. We only have a couple of area rugs in the house and we shake them out inside and vacuum them with the attachment at least once a month but it’s nice to take them outside to beat out anything extra. It’s amazing how scuffed up walls can be after a winter of being cooped up, so it’s nice to take a wet cloth or a magic eraser and wash the walls. We just had a fresh coat of paint put on our whole upstairs so we just had to do the downstairs this year! If you have a small fire extinguisher in your kitchen, check the tag to make sure it’s still good… if not replace it! We take our welcome mat off the front porch and put it in the garage once the snow starts, but this year I noticed it was looking a really worn. Replace it with a new one (find ours HERE) or make your own, I’m loving THIS DIY from Kristen over at Glitter-N-Glue! We take a straw broom and sweep off all the cobwebs and debris not just on the front porch but on the walls and light fixtures out front. I also take a hose and clean off any residual salt on the porch and sidewalk. We have ridiculous amounts of insects from the lake that swarm on the light fixture next to our front door so we started using insect-repelling bulbs and that’s helped a lot. We take it out in the winter when there are not insects to extend the life of the bulb and replace it in the spring. We have a couple of rubber mats that we keep our shoes on inside the front door and they’re always caked with salt after winter… take them outside and scrub them with soap and water then rinse with the hose. I take my Uggs to the laundromat to be cleaned before storing and we wipe down our rubber boots before storing them for the spring/summer. Last year I started taking all of our winter coats to the laundromat once spring hit. This was so great because we took them right home and stored them and as soon as the cold weather hit our coats were all cleaned/mended and we were prepared! We do a pretty good job keeping our kitchen extra clean throughout the year because we spend so much time in it, but I haven’t met a kitchen that couldn’t use a deep clean once a year! We have an electric stove (which I hate, but townhouse rules!) so we start by replacing all the reflector bowls, wiping down the coils and washing all the knobs. Our hood vents are in the bottom of our microwave so I take those out and soak them over night before scrubbing, drying and replacing them. 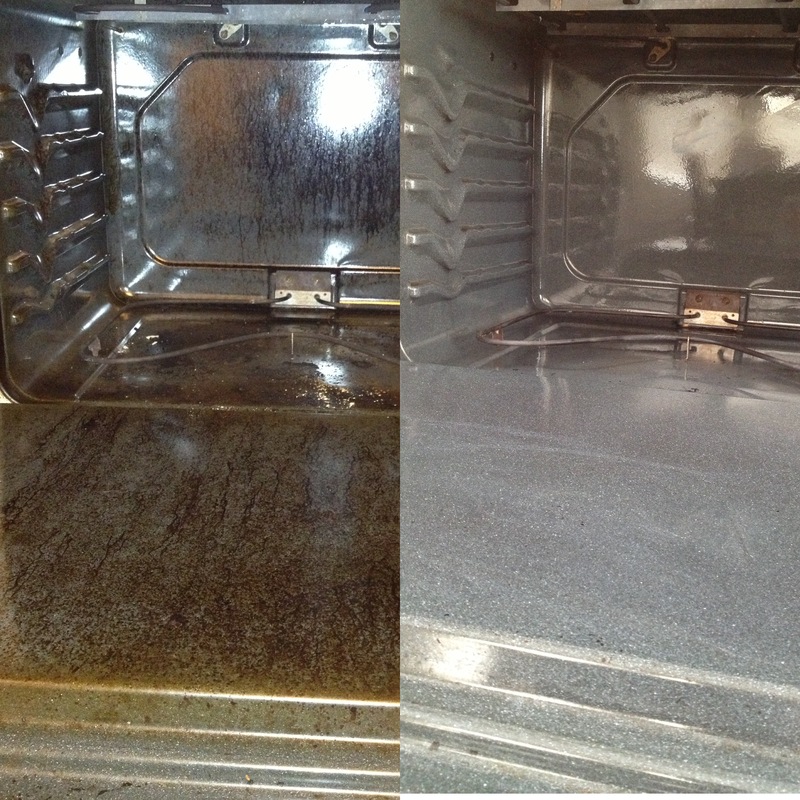 Our oven has a self-clean feature but I’m too scared to use it so I always do it by hand. I am so ashamed to show you what my oven looked like before it was cleaned this year, but I guess my excuse is that we use it a lot? lol. Take your racks out and scrub them in the sink and then make a paste using a box of baking soda and about a cup of water. Use a disposable foam brush and paint the paste ALL over the oven (doors, sides, back, bottom, etc) and word to the wise – spending extra time now making sure every inch of covered in the paste will save you an unbelievable amount of time later. Let it sit over night, then take a bucket with warm water and a sponge and start wiping the paste off. If you took the time to cover everything the night before, it’s all smooth sailing… if not, it’ll take the rough side of the sponge and lots of elbow grease to get the stubborn spots! Just keep scrubbing and wiping working in small sections at a time. I’m embarrassed to be showing you all the before picture but it really does show how easy it is to get from there to the after pictures… plus no harsh chemicals or crazy techniques! Next we pull our fridge out and sweep behind it and the space in between it and the counter. We also turn off the power to it via the breaker and dust the coils in the back. We don’t need to but depending on your freezer now is a perfect time to defrost it! We do take everything out of the freezer and fridge and use bleach to clean out both… don’t forget to replace your box of baking soda! We also dump out all the ice from our ice maker and clean out the tub. We really don’t keep our cupboards stocked… we try to shop only for what we need for a week so we never have things sitting in our cupboards. If you do, nows a great time to go through and throw out anything that’s expired. I do this with all of my baking supplies and spices. Let’s face it, the tops of cupboards and the fridge haven’t seen a cleaning product since last spring, so give those a good dust! We recently got a new dishwasher so we haven’t had to do this as often, but it’s always a good idea to clean out the food trap in yours to make it clean more efficiently and lessen any odors! We used to have heavier weight curtains in the fall/winter and switch to lightweight linen ones in the spring, now we just got rid of curtains in the living room all together and had vertical blinds put in. If you do swap yours out in the spring, be sure to wash the heavyweight ones before storing! My husband always looks at my like I’m insane but every time I vacuum our living room I take the couch apart and vacuum it too. Springs a great time to do that if you normally don’t, plus you should move furniture and vacuum underneath it all. Go through your bookshelves so you can not only wash where the books were but you can get rid of any you’ve read and don’t want to keep! We have a hanging bar in our living room (see it HERE) and I know a lot of people have bar carts so nows a good time to wash all your barware. We have tons of glasses that hang from ours and they collect dust after sitting unused so we wash them all and rehang them. If you have picture frames in these spaces, swap out the pictures for more recent ones… if you don’t have more recent ones make a mental note to take some! Again, most people replace their batteries when they die but I like to replace the batteries in our remotes in the spring. In the winter we switch the spin direction on our fan to clockwise which creates an upward draft, redistributing the warm air hovering near the ceiling throughout the room to heat our home more efficiently. In the spring, switch it back to the normal counter-clockwise spin. 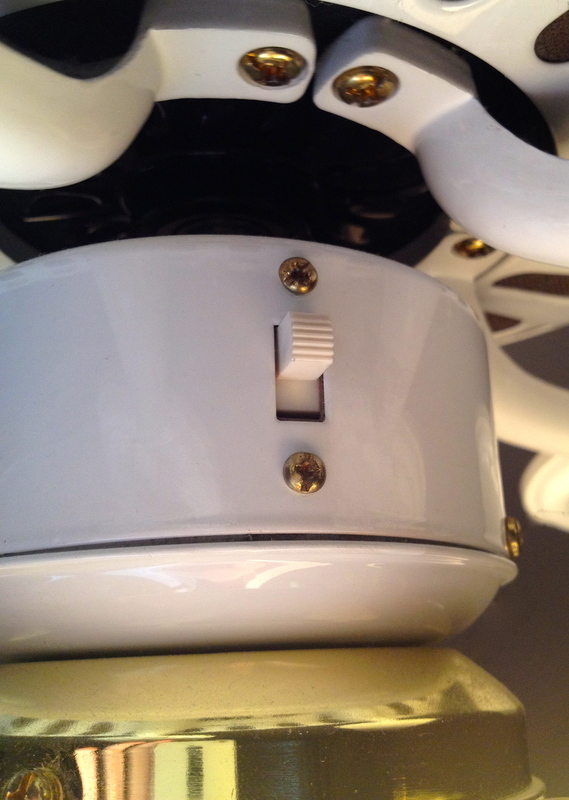 Ever wonder what that switch on your ceiling fan was for?? Dust the blades and base of the fan and replace the lightbulbs. We have a pillow top mattress so we just rotate ours but if you don’t you can flip it too which will help distribute the wear and make it last longer! We change our duvet from a high-warmth rate to a cool one although we get so hot in the summer even with central air and a unit in our room that we don’t need one at all. If you switch to flannel sheets in the winter, switch back to lightweight cotton ones now. I wash all of the pillows in the spring, even my down feather ones. Just put them in your washer with less detergent than normal, on a delicate cycle and wash. I’m going to let you in on my secret way of drying pillows so they don’t lump up in the dryer… tennis balls! Just throw them in with the pillows and set the timer a little longer than a normal load! I also wash my bedskirt at this time because even though I was our sheets and duvet cover every week, I never wash the skirt! Slide the bed out and vacuum underneath it. Now is the perfect time to go through all of your cosmetics and medications to throw away any that are expired and restock your first aid kit. You could wash your current shower curtain liner but since they’re under $5 save yourself some time and just replace it with a new one. 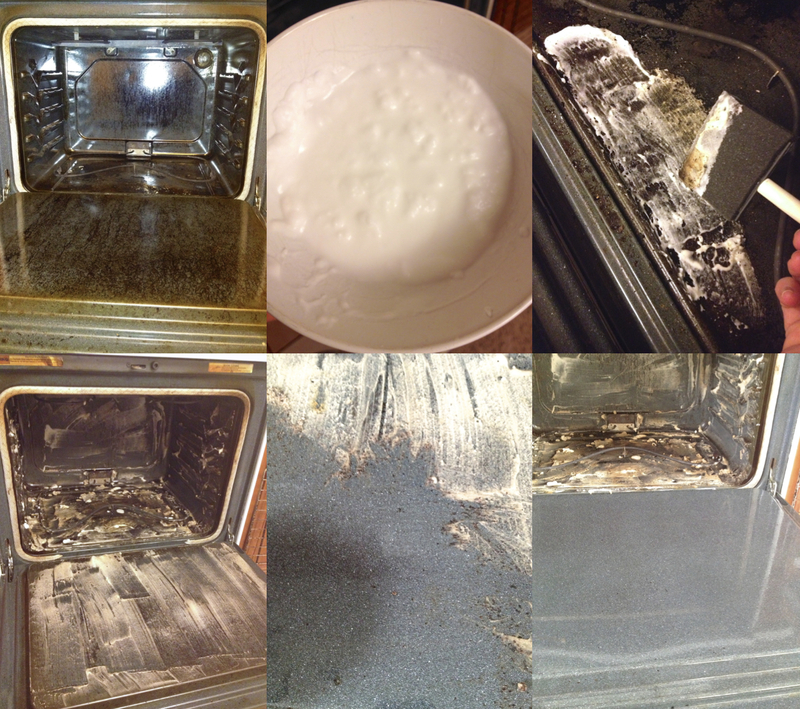 If you have an exhaust fan, take the cover off of and it and clean it. If you have any cracks in tiles or leaks in your grout, now’s a great time to fill those in. If you’re grout it really soiled, apply a new coat of it. I can’t stand clutter under our sinks so when we moved in I put in a plastic set of drawers to hold misc items (find it HERE) and anything else fits neatly into a fabric bin on the other side of the cabinet. 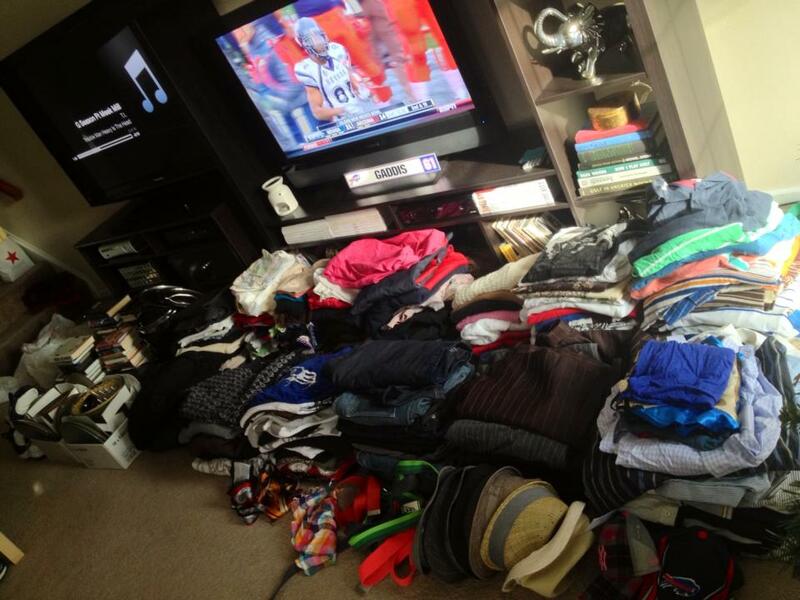 Spring cleaning is a good time to organize this area if you don’t already. I also replace the heads on our toothbrushes (if you don’t have electric ones, replace your actual toothbrush). My computer gets WAY more use than most people’s home computer because I work from it so I tend to clean it a lot. I wipe the keyboard down with a cotton square with a little rubbing alcohol on it to clean the keys and then I use a cotton swab with alcohol to get in between all the keys. My computer’s “tower” is in the monitor but if you have one, clean it out with a can of compressed air. Wipe your monitor down with specialty electronics wipes. Just as you clean the exterior of your computer, you should clean up the actual computer as well. Delete any unused or outdated applications or software and back the computer up. Same goes for your pictures… I have a separate hard drive just for storing pictures but you could also save them to discs of flash drives. Update your home inventory for your insurance, clean out last year’s files and start a box for this year if you haven’t already. I like to keep my “address book” on my computer… that way if it needs updating I don’t have to rip out pages or scribble things out. There’s nothing worse than needing to send something out and not having someone’s address so take this time to update your address book… delete old addresses and add new people. Thankfully we just have a basement and not an attic as well. Our basement is a hot mess and while we’ve been working sporadically to go through it little by little throughout the year this spring is time to get moving! I find that every spring I’m in very cleansing state of mind which makes it easier to part with things that we’ve been holding on to for far too long. Donate all the things that have just been collecting dust or, if you have enough items, hold a garage sale and make some money! Once you’ve gotten rid of all the junk, really take the time to organize what’d left… I’m a huge fan of plastic tubs. I pick see-through ones and I label all of them so I not only can see what’s in them, I can take a quick glance at the label to know for sure. Put the tubs or boxes up on cement blocks so that if you ever have any flooding they won’t be damaged! My dad is always horrified whenever he asks when we changed our air filter last and I always shrug and say “no idea”. I have been getting better but I find it easiest to change it at the start of every season so that a clean one goes in at least every 3 months. It’s also smart to pull out all the things that need mending, tailoring, etc that you keep putting off and either do it yourself or take it to be done. Replace any broken hangers and vacuum the insides of all your closets. We have a cement patio which is super easy to maintain. If there’s any mildew spots once all the snow melts, I use a mixture with one part oxygen bleach mixed with three parts water and a scrub brush to get rid of it. We clean the tracks to our sliding glass doors and check the screen for any tears. We move our patio furniture up from the basement and scrub it with soap and water then rinse with a hose. Our cushions get stored in plastic so they’re good to go. We also bring up the grill and swap out last year’s propane tank for a new one. We simply take our back patio light out in the winter because we don’t use it, in the spring we simply pop it back in. By the time spring hits our garage is a mess… it’s full of leaves, dirty water and salt residue. I start out by taking any recycling that’s left to it’s proper facility and switching our tires from snow tires to all weather. Now that the garage is “picked up”, I sweep all the dirt and leaves out, then I wash the floor with our hose. I like to take this time in the spring to clean out the cars too… either take it to be detailed or clean the inside yourself. I also like to take the cars to the car wash to have the under carriage washed to get all the salt build up from a winter in New York. We put away our winter sporting equipment and bring up the spring/summer stuff like golf clubs, rollerblades, etc. What are some of your go-to spring cleaning tips?? Lol ours was seriously gross like I said I’m ashamed to have even shown it but it’s good to know I’m not the only one! Thanks for the tips and the checklist I will definitely use this. You’re welcome, hope it helps! Argh, this reminds me of what I need to do…..the oven! Lol it’s a necessary evil isn’t it? !